Tried my hand at another dough/crust recipe. 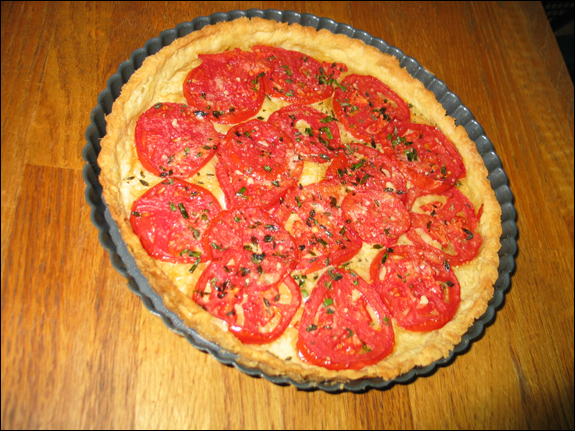 This time a tomato tart. This was a french tart dough with lots of butter, again it was a bit hard to work with as it just became to soft, but all in all it tasted and baked up great. I put a very thin layer of Dijon Mustard on the bottom of the tart then added a bit of grated swiss cheese to help keep the dough from getting soggy (it didn’t!). I also cut and put the tomatoes on paper towels for awhile to drain. It was very good.. and a great first try.